As the saying goes, there's no place like home. Ideally, it's where you feel most relaxed and safest — where you feel like you belong. But what if you didn't? What if being at home started to make you feel nervous, or completely isolated? It may be difficult to imagine, but unfortunately, this is the harsh reality for aging seniors who haven't taken steps to make aging in place more comfortable. They often find themselves without access to certain parts of the home, or the freedom to safely enter and exit at will. Install a stair lift. Whether it's four stairs leading up to the front door, or 20 up to a second-floor bedroom, staircases of any size can be frustrating and dangerous to seniors with mobility concerns. Indoor or outdoor stair lifts can be installed quickly and are easy to use independently. Widen doorways and entry points. Seniors can feel stuck if they're blocked from certain spaces in the home because their wheelchair or walker can't fit through the doorway. A simple solution to freely moving about the home is widening doorways to accommodate. Cover thresholds and transition points. Threshold and entry ramps help anyone in a scooter, wheelchair, or walker pass through doorways and raised landings. They're also handy for anyone unsteady on foot. Stroke. It occurs when blood supply to part of the brain is blocked, or when a blood vessel in the brain bursts. And it’s the leading cause of serious, long-term disability in the United States. According to Stroke Center. 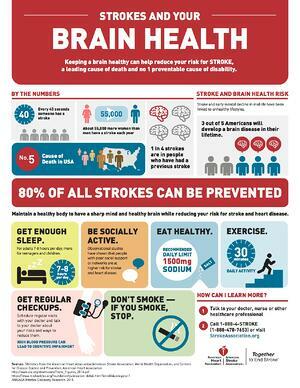 nearly 800,000 people suffer a stroke per year — nearly three-quarters of which occur in people over the age of 65. As sudden, common, and frightening as strokes can be, you can empower yourself with proactive measures that include knowing the symptoms, understanding how to react, and getting the support you – as a stroke survivor or caretaker – need after a stroke occurs. After stroke survival, it’s time to make an action plan for getting your loved ones back on their feet. To get started, visit Amramp’s helpful guide for preparing the home for a stroke survivor here. Other helpful resources are also available online, including the Careliving Guide from the experts at stroke.org. Sparsh was born with an incurable disease called Osteogrnesis Imperfecta, which makes his bones extremely fragile and brittle. He has been gifted with a wonderful voice and brilliant mind. His rapper avatar name is “PURRHYTHM”. George to the Rescue, starring George Oliphant and his team of contractors and designers, rescues the homes of deserving people in the New York Metro area. He can be seen in the New York area on the NBC network. Check your local listings for the schedule. 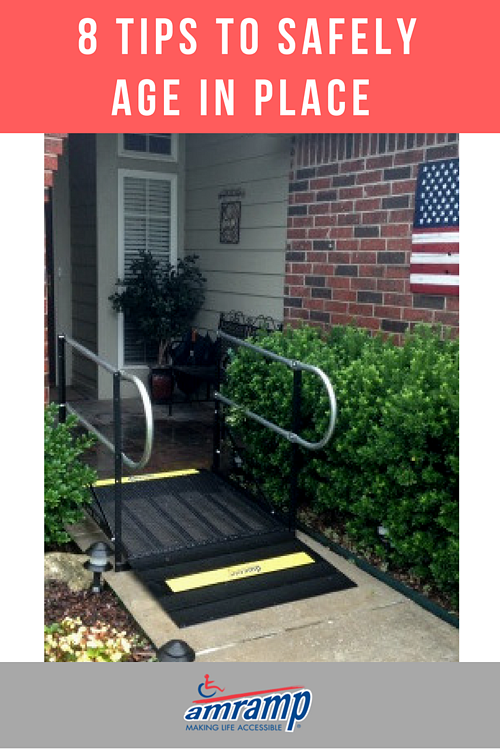 Amramp installs accessibility ramps throughout the United States and parts of Canada at businesses, residences, schools and institutions. 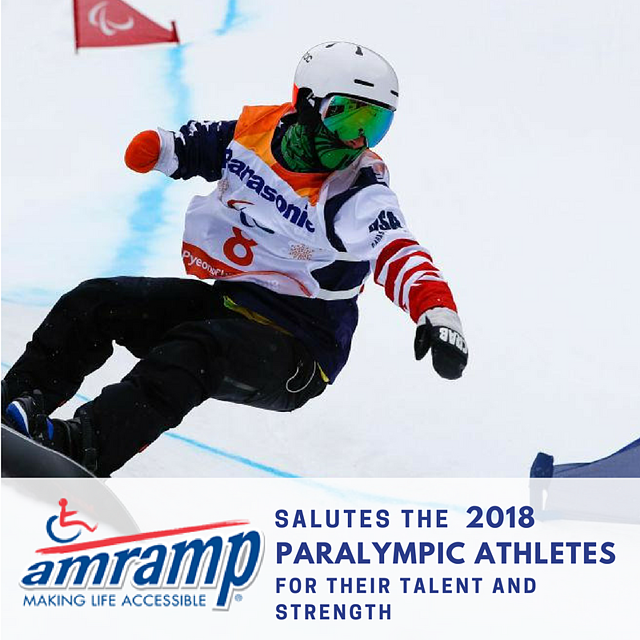 Amramp is the leading company in North America specializing in modular steel wheelchair ramps, offering sturdy, customizable ramps for disability access that enable the aging and disabled population to fully access the community with independence and mobility. Amramp provides a full line of accessibility solutions, including stair lifts, vertical platform lifts and more. Residential and commercial ramps can be installed temporarily for short or long term needs without damaging the structure as they are not a permanent modification to the home. 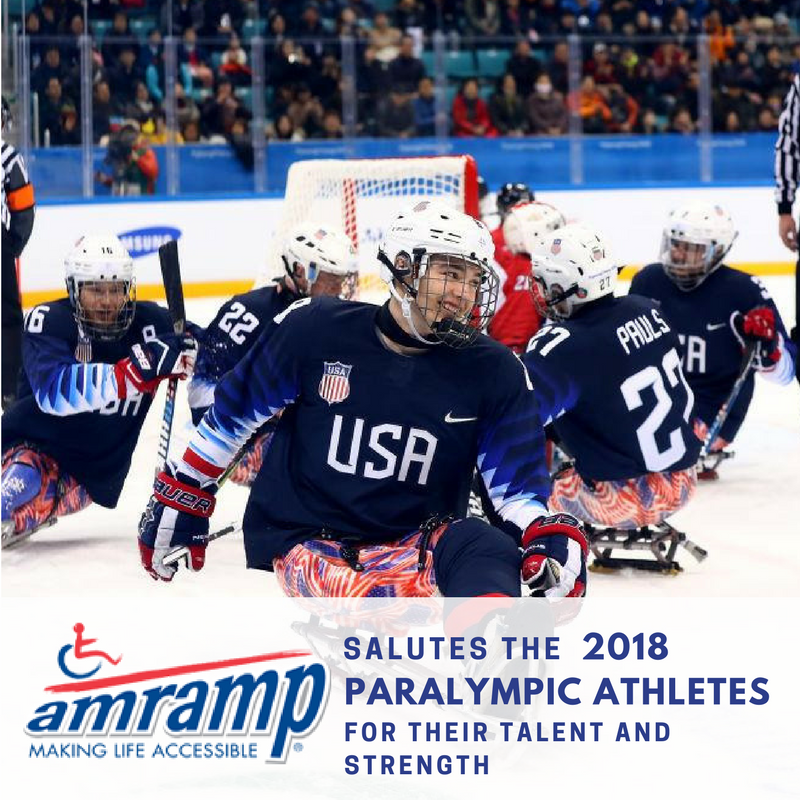 Amramp products comply with the Americans with Disabilities Act (ADA) and are available for sale or rental with no minimum time frame and no ramp size restrictions. For more information on Amramp, visit our website or call 800-649-5215 to arrange a free estimate. The American Case Management Association (ACMA) welcomes Amramp’s accessibility solutions— wheelchair ramps, stair lifts, pool lifts, vertical lifts, portable showers, and more—at its 25th Annual Case Management and Transitions of Care Conference on April 24 - 27, 2018 in Houston. More than 2,000 case management and transitions of care professionals will connect at the George R. Brown Convention Center to shape the future of case management, including length-of-stay reduction, transitional-care planning, social determinants of health and public policy, and more. The ACMA event will also feature 8.5 hours of dedicated exhibit time, where attendees can connect with industry partners and learn about the latest produces and resources available. Amramp will be on-hand to showcase breakthrough products to improve transition of care and support the dynamic needs of case managers and their patients -- bringing patients home sooner and more safely with Amramp’s wheelchair ramps, stair lifts, pool lifts, vertical lifts, portable showers. We look forward to meeting you in Houston, so stop by and see us at our booth! 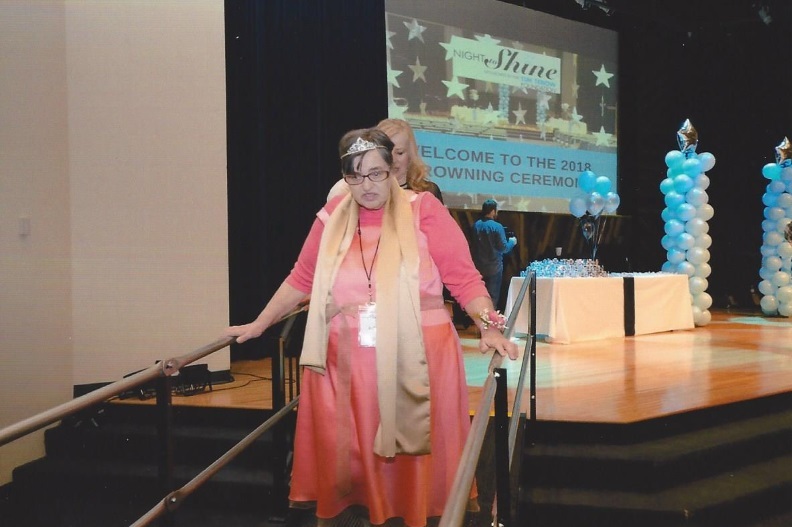 For the second year in a row, the Tim Tebow Foundation reached out to Amramp Western Michigan to provide access to the stage for the 2018 Night to Shine in Kalamazoo, Michigan. 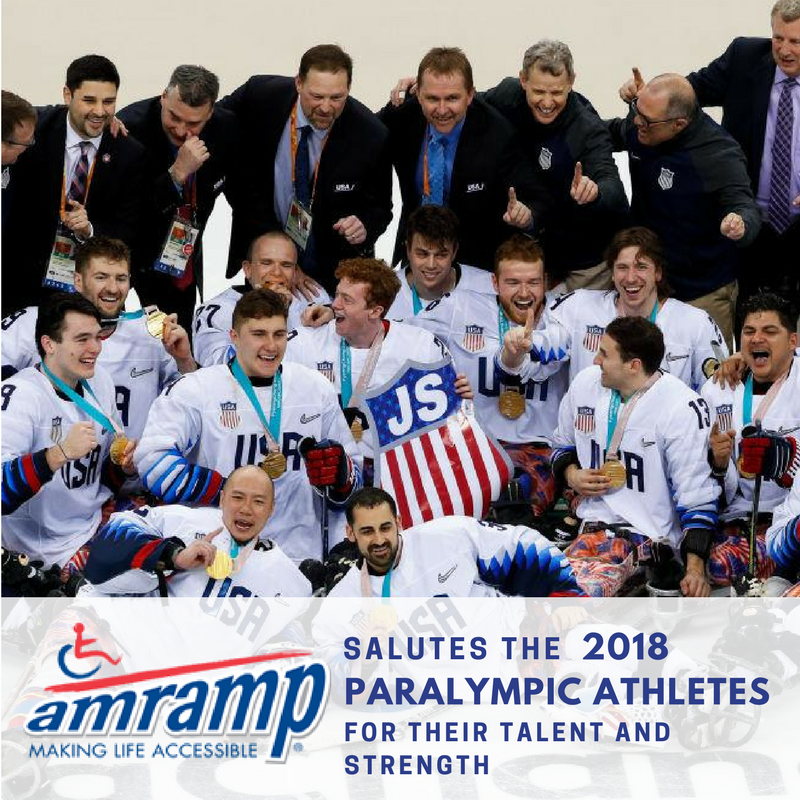 Larry Erlandson and Doug Draeger, co-owners of the Amramp Western Michigan franchise installed two wheelchair ramps so all of the honored guests could access the stage. “We are still smiling from ear to ear reflecting on all of God’s blessings over 2018 Night to Shine – Kalamazoo! Thank you so much for all you did to make it an incredible night for our guests. We greatly appreciate you donating the use of 2 ramps so all our guests could be crowned on stage!”, commented one of the event organizers. The Tim Tebow Foundation is committed to celebrating people with special needs. The Night to Shine is an unforgettable prom night experience, sponsored by the Tim Tebow Foundation, centered on God’s love, for people with special needs ages 14 and older. On one night, February 9, 2018, 537 churches from around the world came together to host Night to Shine for approximately 90,000 honored guests through the support of 175,000 volunteers. Amramp Western Michigan is based in Holland and has been serving the accessibility needs for the entire state of Michigan since 2006 with residential and commercial wheelchair ramps, lifts and other accessibility solutions. Long term or short term rentals available – even for just one night! For more information, please visit our website www.amramp.com or call Doug or Larry at 616-403-6600. 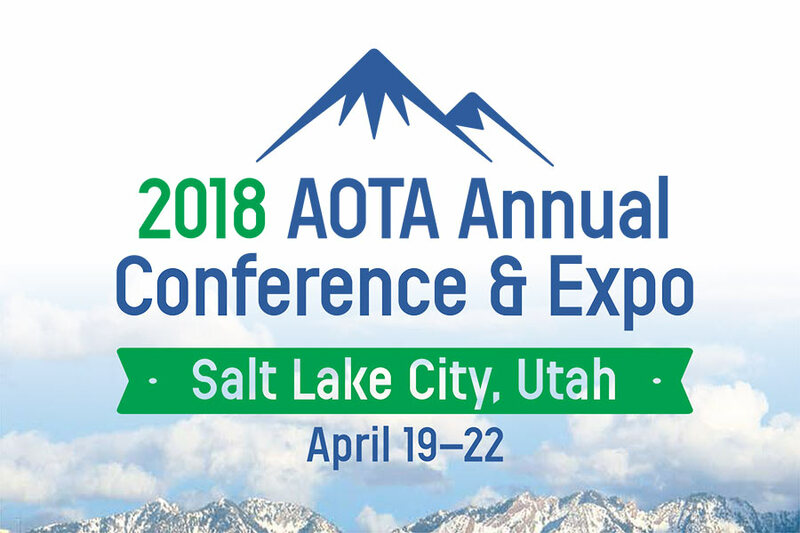 The American Occupational Therapy Association (AOTA) will host its 2018 Conference & Expo from April 19 - 22, 2018 in Salt Lake City, Utah. The event is expected to attract more than 10,000 attendees to Salt Palace Convention Center, making it the world's largest gathering of occupational therapy professionals. Amramp will join practitioners, students, and other industry members coming together to learn about AOTA’s Vision 2025 and catch a glimpse into the future of occupational therapy. Additionally, attendees will hear from dynamic Keynote Speaker Nyle DiMarco, winner of “Dancing With the Stars” and “America’s Next Top Model,” advocate for American Sign Language; Honorary Spokesperson for Language Equality and Acquisition for Deaf Kids (LEAD-K); and Founder of the Nyle DiMarco Foundation. A champion for the deaf community, he will speak to audience members about his inspirational occupational journey. The AOTA event will also feature an expo of industry products and job opportunities for students and practitioners. Amramp will be on-hand to showcase breakthrough products to improve patient transitions and support the rehabilitative work of occupational therapists. Stop by the Amramp booth and see us — we look forward to meeting you in Salt Lake City! 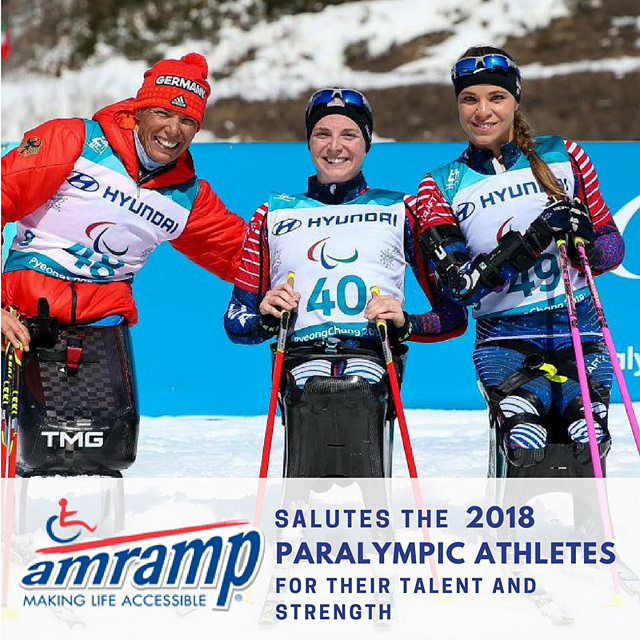 The U.S. team earned the highest number of medals, followed by Canada (28), the Neutral Paralympic Team (24), Ukraine (22) and France (20). 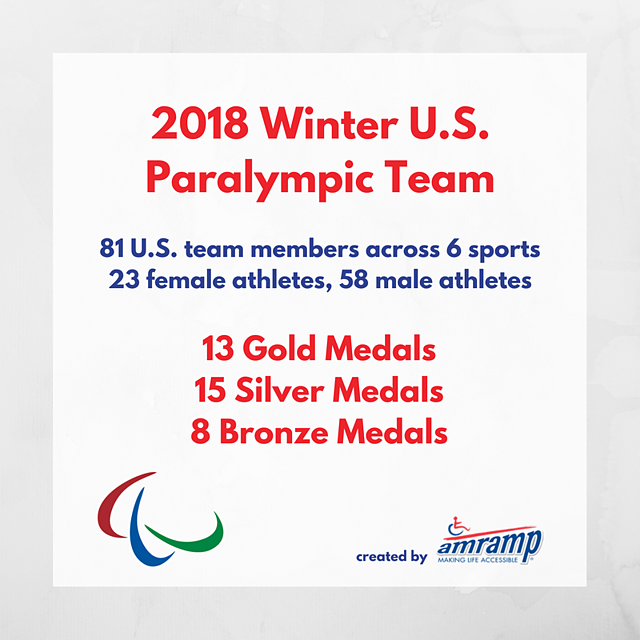 The U.S. team also won the highest number of gold medals (13) , followed by the Neutral Paralympic Team (8), Canada (8), France (7), Germany (7) and Ukraine. Congratulations to all of the Paralympians from all over the world for their triumphs and successes! 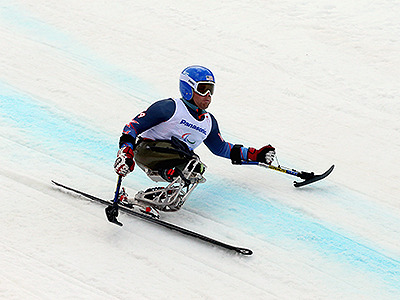 NBC will be covering all six Paralympic winter sports and will be airing a historic 94 hours of it on television. Sochi 2014 only covered 50 televised hours, so it is clear to see that the games will be getting a lot more attention this year. The games will be held in Pyeongchang, South Korea and will begin on March 9th and end on March 18th. Toyota will be the first ever Paralympic presenting sponsor and is also the only auto advertiser for the games. Look out for a whole lot of Toyota marketing. There will be 700 athletes competing in over 80 different winter events. Tune in to watch over 70 Americans try to bring home the gold! Keep up with all of the opportunities and achievements available for wheelchair bound people! 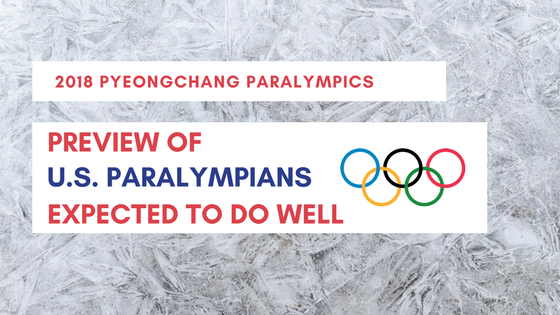 This year's Paralympic games will be held in Pyeongchang, South Korea and will begin on March 9th and end on March 18th. 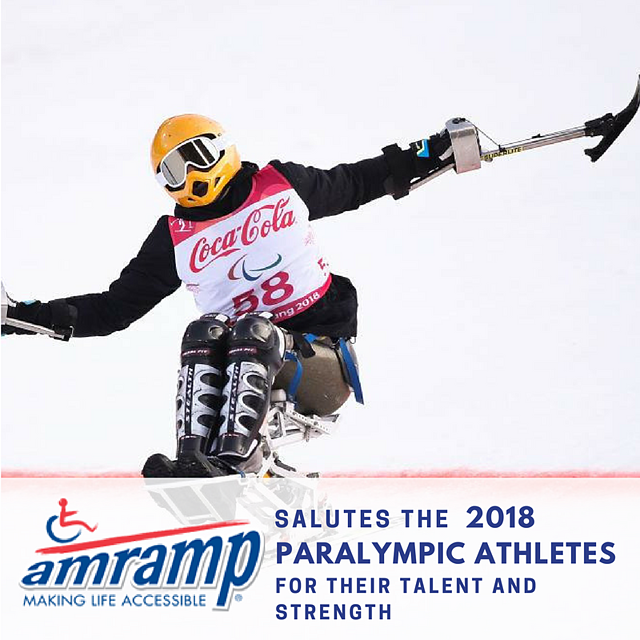 The Paralympic games feature 670 Incredibly talented men and women of different abilities, a 24 per cent increase on the number of athletes that competed in Sochi 2014, according to the Paralympics website. Athletes will compete in 80 medal events across alpine skiiing, biathlon, cross-country skiiing, ice hockey, snowbard and wheelchair curling. Kendall Gretsch is a 27-year old Nordic skier preparing to make her Paralympic debut in PyeongChang. Gretsch, two-time world champion triathlete and former ESPY nominee, was just named one of the three U.S. women to the 2018 U.S. Paralympic Nordic Skiing Team. Gretsch won all three gold medals at the 2018 U.S. Paralympics Nordic Skiing Nationals and is now focused on bringing home the gold again. Gretsch was born with spina bifida and is a wheelchair user, however, once she hits the slopes, she moves with ease, as we can see from her quick transition from the paratriathlon to Nordic skiing. She picked up Nordic skiing in 2015 and qualified for the U.S. national team the next season. Kendall Gretsch has the motivation, athletic ability, and support to become a two-sport Paralympian and will definitely be a force to be reckoned with this coming March. Tyler Walker is a 31-year old alpine skier preparing for his fourth Paralympic Winter Games. Walker is trying to battle back after a serious tumble in Sochi during the last winter games. He continually discusses that he plans for the long term; after the Sochi accident, he was looking to how to make his game better for years and years ahead. Tyler was born with a section of his spine missing and had to undergo surgery to get both of his legs amputated when he was four-years old, but has only become stronger from these experiences. He won his first giant slalom overall world cup when he was still a teen and has continued to perform well throughout his lengthy career. Walker is a relentless athlete and a courageous role model. He has shared with the world his ups and downs, admitting when he was at his lowest and sharing that it is okay to feel that way. Though this could be Walker’s last Paralympics, he shows a lot of promise in bringing back his first medal for the U.S. team. Andy Soule is a 38-year old army veteran turned Nordic skier. After the 9/11 terrorist attacks Soule was inspired to join the army and was sent to Afghanistan. In 2005, Soule lost both of his legs to a roadside bomb and after recovering, turned to sports as part of his rehabilitation. Soule uses a sit-ski that allows him to sit while propelling himself with poles and made history when he was the first American Paralympian to win a biathlon medal. 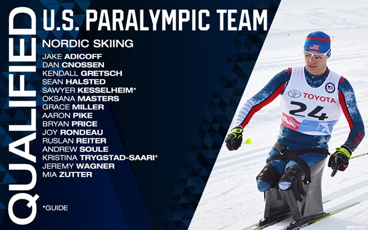 This will be Soule’s third Paralympic Games, and he was just recently announced to be a member of the Nordic skiing team. Along with being a Paralympic skier, Soule is a ballistic specialist, meaning he can put together and take apart rifles expertly. Soule has many passions, but has always loved physical competition, which is what has driven him to be so successful in years past and hopefully in this year’s coming games. 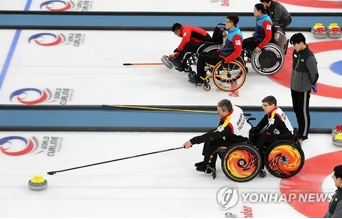 • Wheelchair curling – 1 medal event and 48 male and 12 female athletes (each team must have a minimum of one female player). Keep up with all of the opportunities and achievements available for wheelchair athletes. Join Amramp at the groundbreaking AGC Annual Convention in New Orleans, showcasing dynamic building solutions for contractors nationwide. Formed in 1918, the Associated General Contractors of America (AGC) will celebrate 100 years of construction at the 99th Annual Convention in New Orleans from February 26 - 28, 2018. With more than 2,500 construction professionals expected to attend, the event will feature the latest on industry innovation, safety, relationship-building, progress, and more. AGC's Annual Convention 2018 will also feature a range of educational opportunities for attendees, with CEUs offered for various sessions daily. The convention is attracting attention for is a highly esteemed lineup of featured speakers, promising to be a big draw for the event. The opening session features Isaac Lidsky, who transformed an $11 million concrete subcontractor into an industry-leading $150 million construction services company in 5 years. Also included in the convention's lineup are Neil Jacobstein, delivering the Construction Risk Partners Build America Awards Keynote, and who will give the Willis Towers Watson Construction Safety Excellence Awards Keynote. The closing keynote speaker is Stephen F. Hayes, editor in chief of The Weekly Standard and author of two New York Times bestsellers: The Connection: How al Qaeda’s Collaboration with Saddam Hussein Has Endangered America and Cheney: The Untold Story of America’s Most Powerful and Controversial Vice President. Amramp is excited to bring commercial-grade wheelchair ramps to the 2018 AGC Equipment, Technology & Construction Solutions Expo, connecting with contractors and industry representatives to highlight our offerings and solutions. Stop in to see us at our exhibitor booth – and learn more about how we can advance your next construction project to better meet clients' needs. We look forward to seeing you in New Orleans!